Storytelling is an art as old as human civilization. It can cross or establish boundaries, unite or divide cultures, and give context and meaning to our shared existence. Throughout its history, the University of Kentucky has fostered a rich culture of storytelling. Long considered a cradle of Kentucky authors, the university is making headway in supporting the work of authors more representative of the national scene. 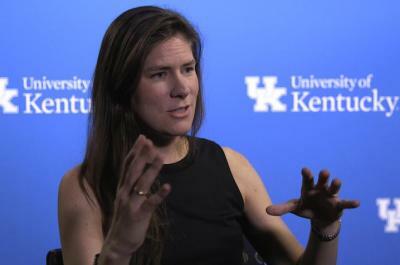 On this episode of "Behind the Blue," we welcome one of those authors, UK Assistant Professor of English Hannah Pittard. Pittard has published three novels: 2011’s "The Fates Will Find Their Way," which received a favorable review by The New York Times Book Review. Her second novel, "Reunion" (in 2014), was an editor’s choice by the Chicago Tribune. In 2016, she released "Listen To Me," and is now completing work on her next book, "Atlanta, 1962," which will be released in 2017. During our conversation Pittard discusses lessons in generosity learned from her students, how she’s never forgotten that success in published storytelling is based on luck, her pick of "Madame Bovary" as the best novel in existence, what she feels may be one of the best kept secrets in Lexington, and more. Click here for "Behind the Blue" on iTunes. Click here for "Behind the Blue" on Stitcher.